In its initial work, DRPI recognized the many tasks needing to be accomplished in order to move toward a holistic monitoring of disability rights. It was clear that one questionnaire, or one audit or one data collection method would not be sufficient to build towards a comprehensive understanding of the rights of people with disabilities and the discrimination they face. This meant breaking down the work into “doable” tasks, that would require different skills, different time frames and different knowledge bases. Consequently, the first step was to identify potential collaborators to assist in developing the methodology for this work. DRPI decided to develop partnerships with people in various fields from a number of countries to see if they would be willing to share their knowledge of human rights monitoring or assist in the development of data collection tools and methods of analysis. These supportive partners include people who have given time and energy because of their belief in the need for real change, as well as individuals, organizations and international bodies with established expertise around particular tasks. DRPI has adopted three broad areas for monitoring based on recommendations by the participants at the Almåsa Seminar: monitoring systems, monitoring individual experiences and monitoring media. Human rights monitoring has been broken down into these areas to find the discrete pieces of knowledge in order to paint a picture of the current situation faced by individuals with disabilities. Data collected during the monitoring activities in all three areas will be used as evidence for advocacy efforts and improved government policies and laws. The three broad areas for monitoring, monitoring systems, monitoring individual experiences and monitoring media, are representing in the following Venn diagram. Monitoring individual experiences involves fact finding with respect to alleged individual violations of the human rights of people with disabilities. Monitoring human rights violations against people with disabilities will raise awareness of the nature and extent of violations and provide facts and evidence for advocacy efforts and improved government policies and laws. Monitoring systems involves studying legislative frameworks. While laws may protect human rights, they may also violate human rights in some instances, either through a discriminatory provision or through silence on the rights of people with disabilities. Documenting the way laws violate or protect disability rights, and how relevant laws are implemented and enforced, will inform struggles for legislative reform. Monitoring systems also involves tracking case law before the courts and statutory human rights bodies. Compiling and analysing disability cases will generate evidence of how courts and other decision-making bodies, such as human rights commissions, address issues related to disability rights, interpret and enforce relevant laws, and use human rights law. Beyond laws and their enforcement, a broad range of government action has a direct impact on the lives of people with disabilities. Analyzing and documenting general government policies, programmes, services and practices that violate human rights – either directly or indirectly – will provide evidence and awareness for change. 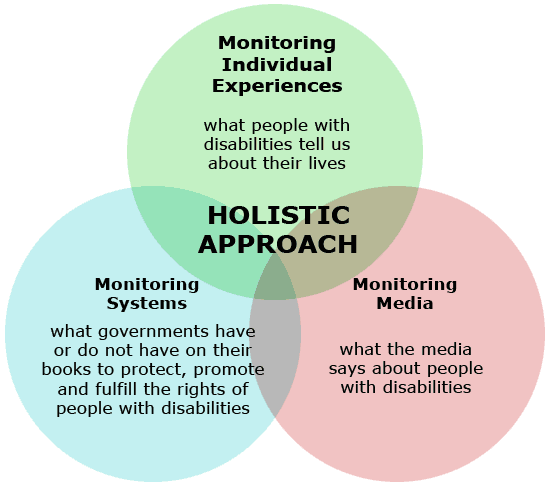 Monitoring media involves tracking media imagery and coverage of disability. The media have a powerful influence on the way disability is perceived and on the attitudes of the public towards people with disabilities. It is important to document myths and stereotypes perpetuated by media portrayals of persons with disabilities and also highlight effective reporting of disability issues. For more information on the DRPI’s monitoring activities and findings, you can access our Resources and Publications page.